The benchmarking indices - Sensex, Nifty - closed one percent lower on Thursday amid sell-off, US Fed chief reiterates December rate hike plans as per schedule, besides investors applied caution over Bihar poll results. Mumbai: The benchmarking indices - Sensex, Nifty - closed one percent lower on Thursday amid sell-off, US Fed chief reiterates December rate hike plans as per schedule, besides investors applied caution over Bihar poll results. Banking, healthcare, technology and metal stocks dragged the markets as investors seen nervous ahead of exit polls, expected on Thursday evening. 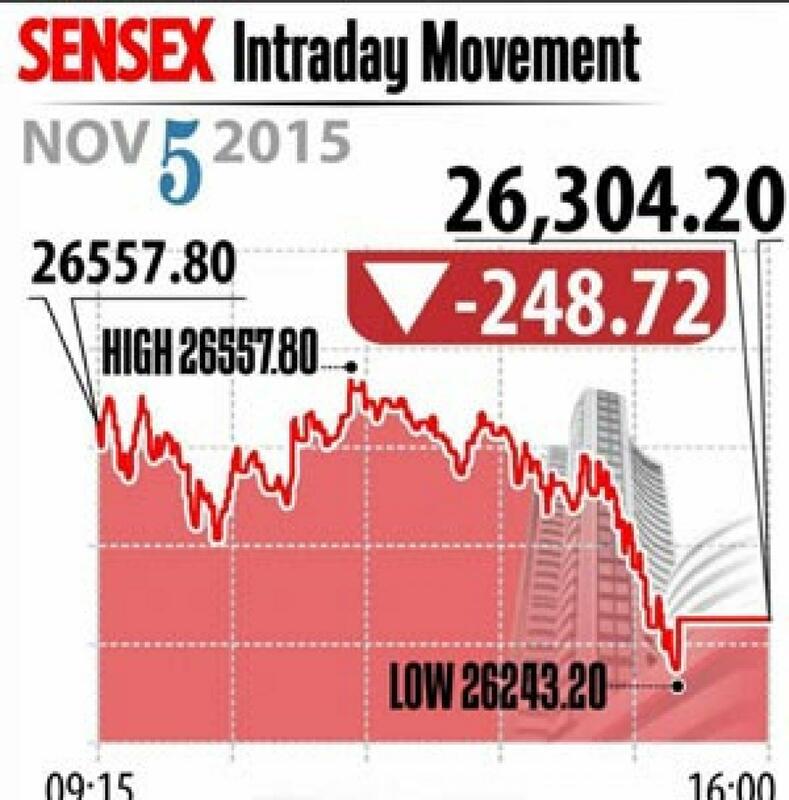 Sensex declined ended down 249 points at 26,304 level, Nifty closed 85 points down at 7,955 levels. Also, the broader markets underperformed with midcap and smallcap indices closed lower 1.5 per cent each. On the long-term, the markets are looking for government's spending and reforms in order to revive in the post Bihar elections, although, it will not give any material change in terms of number game for the government in Rajya Sabha, but impacts the investor sentiment in the near-term. On the sectoral front, realty and healthcare indices fell over 2 per cent, while bank index dropped 1.5 per cent. The metal stocks down over Fed rate hike as Vedanta, NMDC, Jindal Steel and Hindalco closed lower between 1 to 5 per cent each. From banking space, HDFC Bank, SBI, ICICI Bank, Axis Bank down between 0.4 per cent and 2 per cent, on the other hand auto shares gained hoping higher sales during festival season. M&M, Maruti and Hero MotoCorp closed gaining up to 1 per cent. Index heavyweights Infosys, RIL, TCS, Cipla and Airtel were down up to 3 per cent. While midcaps Jubilant Foodworks down 5 per cent and Arvind gained 5 per cent as the company reported better profits. The gainers: Coal India, up 2.13 per cent at Rs 337.30; NTPC, up 0.97 per cent at Rs 136; Hero MotoCorp, up 0.93 per cent at Rs 2,638.60; ITC, up 0.60 per cent at Rs 337.55; and M&M, up 0.50 per cent at Rs 1,260.15. Thelosers: Vedanta, down 4.66 per cent at Rs 94.10; Tata Steel, down 4.33 per cent at Rs 225.60; Sun Pharma, down 4.28 per cent at Rs 815.85; BHEL, down 3.31 per cent at Rs 194.20; and Bharti Airtel, down 2.82 per cent at Rs 335.90.